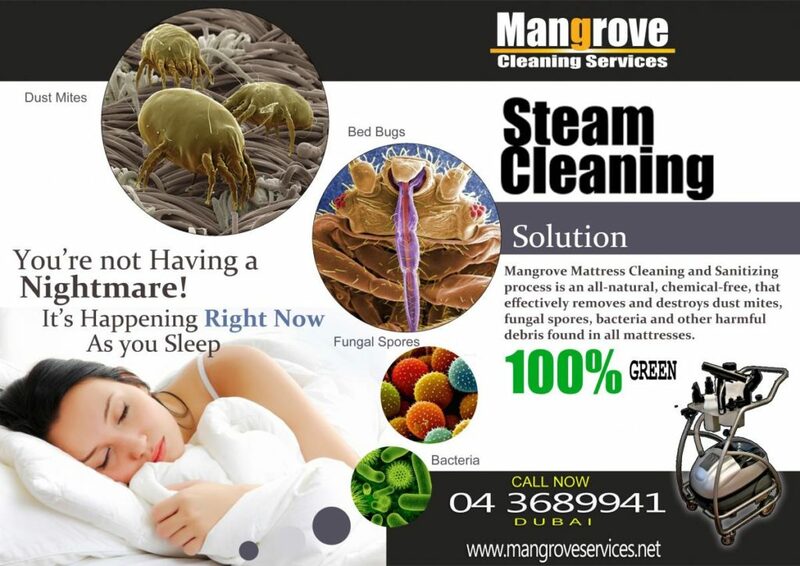 Mangrove Cleaning Services Dubai is probably the only Mattress Cleaning Company in Dubai that uses Steam Cleaning Machines to not only Clean but Sanitize your Mattresses. Steam Cleaning removes stains, Dirt and soiled areas, kills Dust mites, Bedbugs and their ova and 99.9% of Bacteria. Our Unique equipment and Steam Cleaning Method involves agitating the dirt particles through Hot and Dry Steam injection and Extraction at the same time. This method not only ensures the removal of Stains, Dirt, dead skin cells that feed Dust mites but also sanitizes the mattresses by ridding it off the Dust mites and other Micro-organisms. Steam Cleaning enhances the life of your Mattresses. Steam Cleaning is 100% Green and thus safe for your Family’s health and our Environment. It save massively on Water.